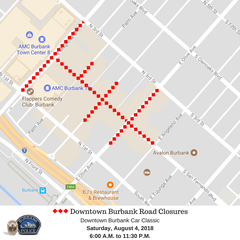 The 7th annual Downtown Burbank Car Classic will take place this Saturday, August 4, 2018, from 3:00 P.M. to 9:00 P.M.
>> Magnolia Blvd. will be CLOSED between First St. and Third St.
>> San Fernando Blvd. will be CLOSED between Magnolia Blvd. and Angeleno Ave.
>> Palm Ave. will be CLOSED mid-block, west of Third St. to San Fernando Blvd. >> Orange Grove Ave. will be CLOSED mid-block, west of Third St., to mid-block, east of First St.
>> Olive Ave. will be CLOSED from mid-block, east of First St. to Third St. These road closures are scheduled to remain in effect until 11:30 P.M.; however, closures may be lifted earlier than expected following the conclusion of the event.